David Ridley became Coxmoor's third professional in its 85 year history in 1986 and, barring unforeseen circumstances, he is likely to be here to help the club celebrate its centenary in the year 2013. He sees no reason to look for change at this stage in his highly successful career. `Coxmoor is one of the best courses you will ever play,' he says. Although the conditions can sometimes be tough for higher handicapped players, David is convinced that it is an essential part of Coxmoor's quality and character which, along with Hollinwell, Sherwood and Worksop, sets it apart from lesser courses. `That is why these courses develop so many good players, compared with the south of the county,' he maintains. `The heathland turf means the ball sits tight and you have to hit it just right, so ball strikers here become so much more superior. `That is why Coxmoor has produced so many good iron players like Alec Shepperson and Alan Crafts. In his heyday on the European tour, David Ridley wasn't a bad striker of the ball either. Born in Darlington, Co Durham, he shared his early golf with cricket and football, under the guidance of his grandfather. The old chap had clearly got a good eye and it soon became obvious that David had got real potential to make it in the game. He was sent down to the Fulwell club in Twickenham for weekend sessions with top coach Bill Cox who was helping a number of young players including pioneering Italian professional Baldovino Dassu with whom David became firm friends. That led to David being offered the job of assistant at Fulwell and at the age of 16, he left his north country home and headed for London. His ambition in those exciting early days was clear - to make it on the professional circuit. He quickly made his mark on the Middlesex scene, winning the assistants and professionals championships and then adding the South Wales PGA title in his first foray 'abroad'. Ambitious from the start, David had his first tilt at the Open Championship when he was only 17. He took a two day holiday so no-one at his club would know and he entered the qualifying competition. But the young upstart shocked everyone by getting through to the championship proper, a fact that was recorded in the local newspaper. Two club members were impressed enough to sponsor young David for the big event and so he headed off to Royal Lytham and St Anne's. After nine holes of his first round in his first Open, his name was up on the leaderboard, having taken 34 shots to the turn. He finished that opening round with a 78 and was not able to score well enough in the second round to beat the cut, but he had gained enough encouragement to believe that he could cut the mustard on the European tour. For the next five years, he travelled the world with contemporaries like Craig Defoy, Peter Oosterhuis and John Garner. 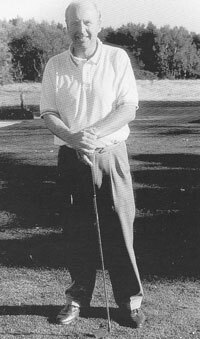 In 1970, he finished 37th in the Order of Merit, while his best tournament result came in Ireland when he finished third behind New Zealander John Lister and Tommy Horton, now a highly successful figure on the seniors tour. `At the age of 18, I made money quite quickly, it just happened for me,' said David. It was a spell away from the constant demands of tournament golf that opened up a new direction for David's career. He was employed as a coach for cruise passengers on board a luxury liner in the Gulf of Mexico and it quickly became clear that David had an aptitude for getting his ideas across. 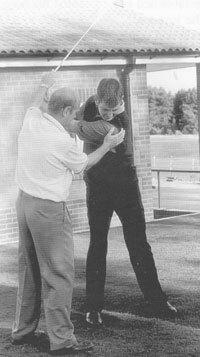 So, in 1974, he took on his first club professional's job at the newly opened Oxton course, combining his duties there with Midlands tournaments and, occasionally qualifying for the Open championship. On the Midlands scene, he established a reputation as the man to beat, taking a string of titles and topping the Order of Merit in 1985. He was twice selected for the Great Britain and Ireland team which contested the biennial club professionals' version of the Ryder Cup, helping the home team to victory in 1979 at Castletown on the Isle of Man, when he scored two wins and a half. He followed that up by scoring two more wins when the competition was staged at Turnberry Island in Florida. David had his last shot at the Open in 1984. It was his fifth appearance in the final rounds of the competition. `I was sat in the locker room and looked up to see Seve, Tom Watson and Tom Kite all getting ready to go out. By now, David was well established at Coxmoor and discovering the joys and satisfaction of coaching young and old. `A club professional has to specialise -either in the retail side, as a club manager, or as a coach.' he explained. It is a job he takes very seriously. 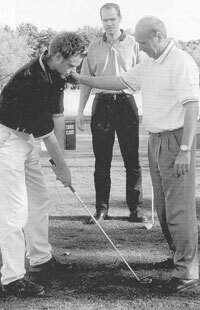 To achieve that he has travelled to America and studied the methods of Jimmy Ballard, the legendary coach who has helped the careers of people like Sandy Lyle, Curtis Strange and Jesper Parnevik. David has also completed a sports psychology course to help him better understand the mental side of the game, and he has even teamed up with martial arts expert Ron Cuthbert to develop his knowledge and application of muscle movement. He is especially involved with the young players from the East Midlands region and has been the English Golf Union's regional coach for more than ten years. He coaches young players for the Midlands Golf Union and Notts Union of Golf Clubs, helping the likes of Mark Foster, Liam White, Coxmoor's Greg Owen and Lee Westwood to come through the junior ranks. But he is quick to point out that you don't have to be a single figure player to enlist his help. `I like to take people from beginners to tournament players and make them swing the club better. Before we leave the ranks of the professional, a quick quiz question: which Coxmoor member has won the Open, the US Open, the Masters and been part of the winning Ryder Cup team? Answer: Dave Musgrove, one of the top caddies in the world. Dave, whose home is in Kirkby and still plays off 12 when he takes a break from his travels, began caddying at Hollinwell as a youngster. He carried on while working in the coal industry before deciding to become a full time caddie. Since then, he has carried the bag for a who's who of greats from his early days with Roberto di Vicenzo, to Seve Ballesteros - "lots of aggro and much money" - Sandy Lyle, Tom Watson, Scott Hoch and for the past few years, US Open champion Lee Janzen. With one eye on the future, Dave and his wife Hilary have been developing a golf books business and he is always eager to hear from anyone who might have a volume or two.